Flea Infestation - What To Do When Capstar Doesn’t Seem To Work? Flea Infestation- What To Do When Capstar Doesn’t Seem To Work? 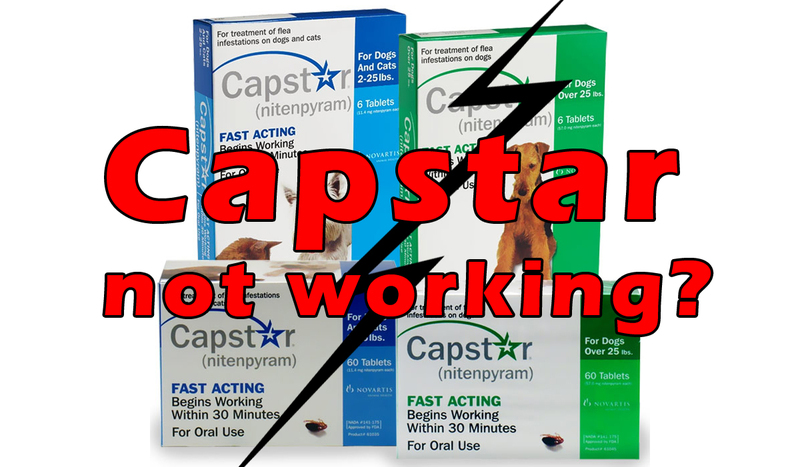 There have been many misconceptions about Capstar, the fastest, short term flea preventive. Pet owners have many complaints regarding this tablet, like it works for just one day, or fleas are spotted even after treating the pet with this tablet. Today we’ll discuss some facts about Capstar and what should you do when it doesn’t seem to work! Capstar is a short term treatment to get rid of heavy flea infestation and it is meant to work for 24 hours only. If you have a complaint that it is ineffective after 24 hours, then you are unaware about the working of Capstar. This oral tablet has an ingredient, Nitenpyram that target adult fleas on the pet’s body. Nitenpyram kills almost all adult fleas within 5-7 hours of administration. After 24 hours, this active ingredient is flushed out of the pet’s body through natural processes. Thus, as the main component of Capstar stays inside the system only for 24 hours, you may need to administer another tablet the next day for continuous effectiveness. If Capstar is effective, why do I spot fleas on my pet? This product from Novartis was introduced to deal with heavy flea infestations in short amount of time. It does not destroy the juvenile stages of fleas (eggs, larvae and pupae). Thus, these early stages of fleas grow to be adult fleas in the following days. So, the fleas that you see after the administration of Capstar are the newly hatched ones, and not those that were already there. To avoid the re-infestation, you may either need to administer Capstar every day, or follow its administration by a long-term parasite control which targets the early life-stages of fleas. What else you could do to get rid of fleas? Following the administration of Capstar, apply a long term spot-on flea treatment (Frontline plus) or a tablet that eliminates the juvenile flea stages and blocks the probability of its re-infestation. Buy a flea shampoo. Washing your pet with it will destroy the eggs of fleas, barring its further development into adult pests. While you bathe your pet, don’t make it a hasty business. Take your time so that the shampoo gets time to work on your flea ridden pet. Flea comb has been the oldest method of dealing with external parasites. Use it for grooming your pet, especially after bathing him with flea shampoo. Fleas tend to hide in any corner doing its business of laying eggs. Chores like regularly vacuuming the carpets, pet’s bedding, sofas, etc. is important to get rid of juvenile flea stages. Timely washing of your pet’s stuff like bedding covers, pillow covers, or anything on which your pet sits or sleeps is essential for his healthy, flea-free living. In all, Capstar works just fine for canines and felines. To maintain the hygiene around your pets, you may need to follow the above tips apart from using flea preventives. Then and then your home and pet may get complete freedom from these pesky fleas. « Columbus Day Discounts On Pet Care Supplies- 8% OFF On All Orders!